I was a successful graphic and web designer and entrepreneur in Egypt, but I was forced to leave by national unrest. I was unfamiliar with the UK labour market – I simply did not understand the importance of networking – and I lacked UK experience and references along with big gaps on my CV. I also had some technical skills gaps. Transitions helped me learn about the UK labour market and acquire experience and references through work placements. 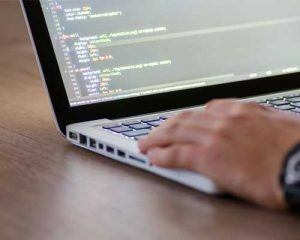 I made a complete overhaul of my job seeking strategy and tailored my CV for each role, work experience in online marketing and software development and a coding course paid for by Makers Academy helped me to fill my CV, gain references, keep up with professional practices and fill skills gaps. The placement was very successful, eventually leading to permanent employment. It’s good to know the people you’re working with and have a collaborative professional relationship with them. I have been able to demonstrate my identity and become confident enough to express my opinions and ideas. I’m more optimistic about my prospects in the UK and my economic situation has improved a lot. I recommend Transitions’ services – I wish I had known about them earlier! At Capgemini we want to build a workplace that reflects the diversity of our clients and sound data shows that diversity of thought is what drives companies forward. Ultimately we know diverse teams have a positive impact on company performance because people’s differences and variety of perspectives can help us to problem solve and deliver the best for our clients. Consulting with refugee professionals has provided us the opportunity to review our hiring strategies and processes to ensure they’re as inclusive as possible. We want to give everyone the best chance to be successful when interviewing with Capgemini (or other prospective employers) – no matter the individual’s cultural expectations and background. 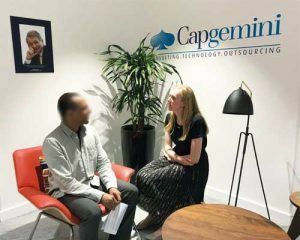 Refugee professionals represent a new, untapped talent pool and working with Transitions to develop that talent has been successful for Capgemini. Our overall experience working with Transitions has been very positive.